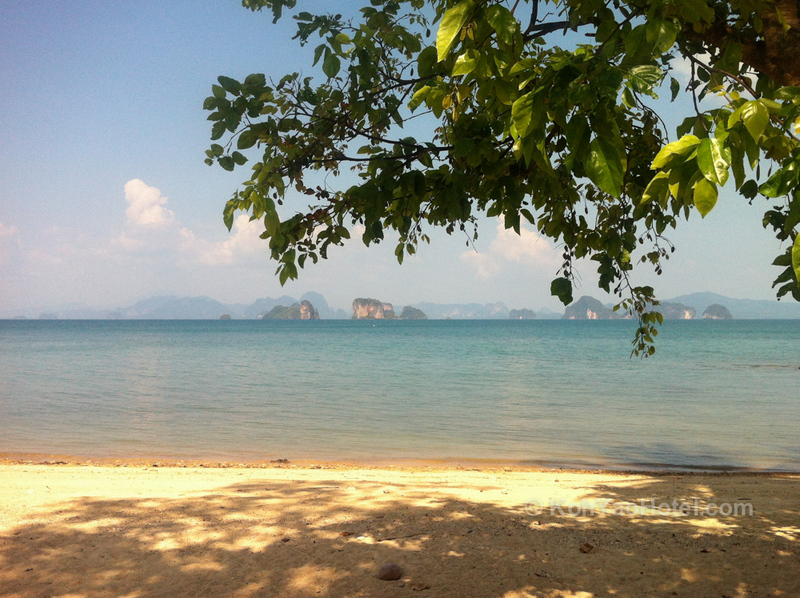 Klong Jark beach is arguably the best beach on Koh Yao Noi. It’s a narrow strip of empty white sand a couple of kilometres long with large trees growing at the road level above the beach providing welcome shade. 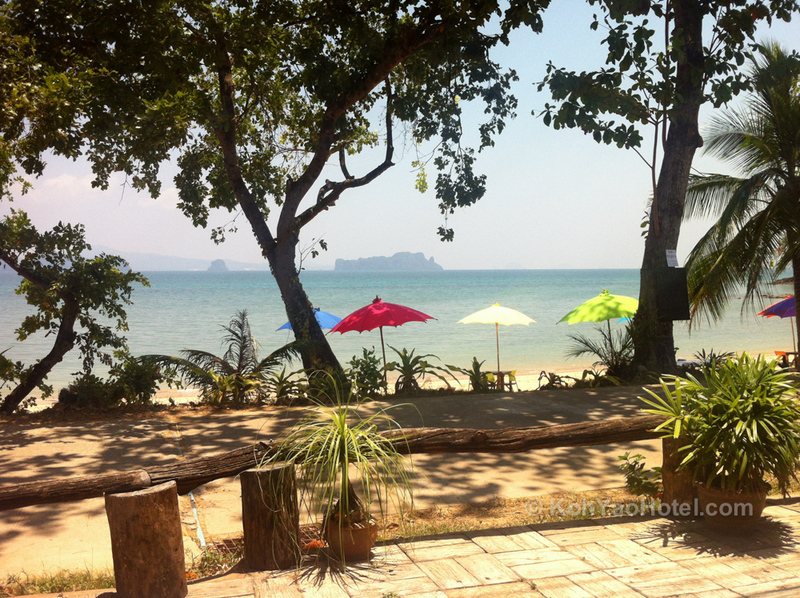 The longest beach on Koh Yao Noi, Klong Jark beach is broken up into three distinct sections – southern, central and northern, with three distinctive atmospheres. This beach stretch is the most popular part of Klong Jark with three resorts located here – Villaguna, Niramaya and Sabai Corner. 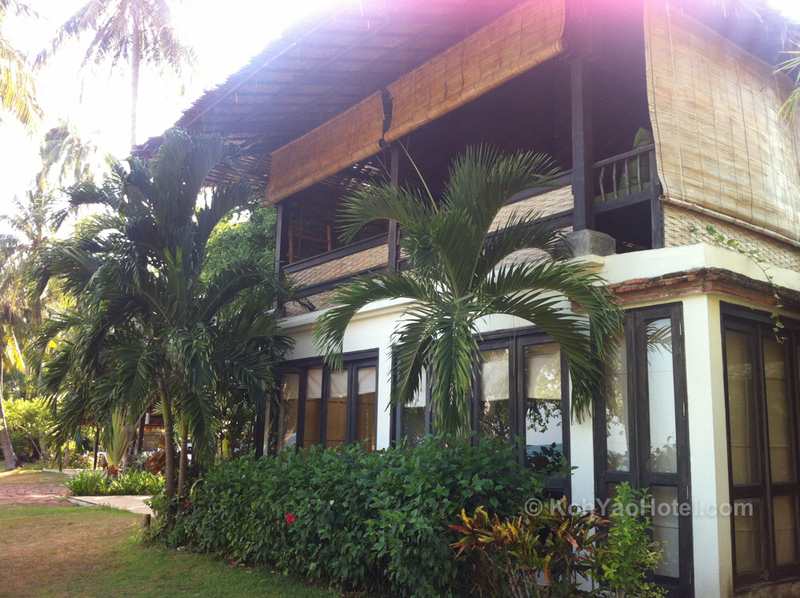 Villaguna Resort is a collection of upmarket bungalows, and has a spacious, airy and very welcoming restaurant overlooking the beach. 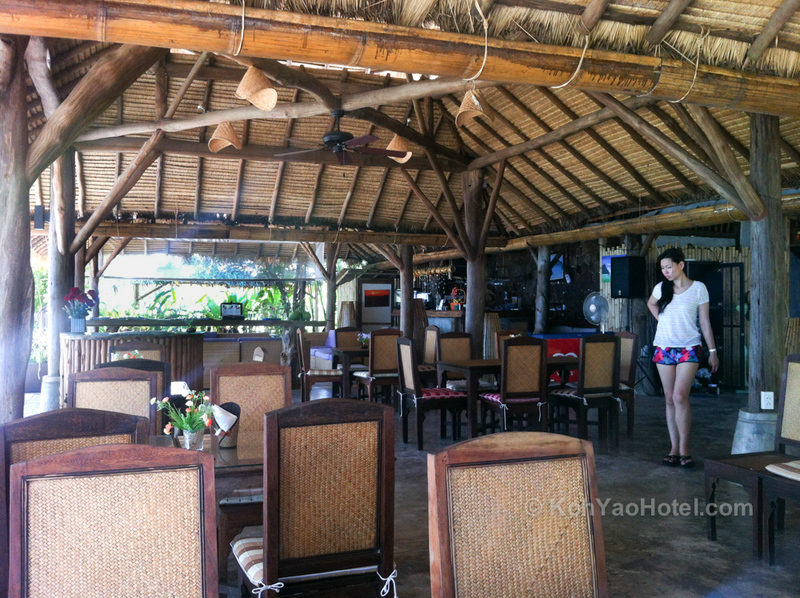 Open on three sides, the restaurant the perfect place to sit and while away the afternoon over lunch, dessert and drinks, all the while surrounded by a panoramic view of the ocean and the surrounding islands. The restaurant also places a few chairs and sunloungers on the beach, and it feels like you’ve got the whole place to yourself. There’s a couple of other places to eat nearby along the road, like the Pyramid restaurant and also the Green coffee shop. The road itself is almost always empty, with the occasional car or bike passing by. It’s remarkable how quiet it is. Next door to Villaguna is the equally upmarket Niramaya Villas and Wellness Resort, which is a collection of spacious, detached villa rooms. This resort specialises in spa treatments and yoga, and you can see why they chose Klong Jark as a place of peaceful relaxation. The sunrises in the morning come up directly over Klong Jark beach, providing a stunning view for those who can get up early enough. 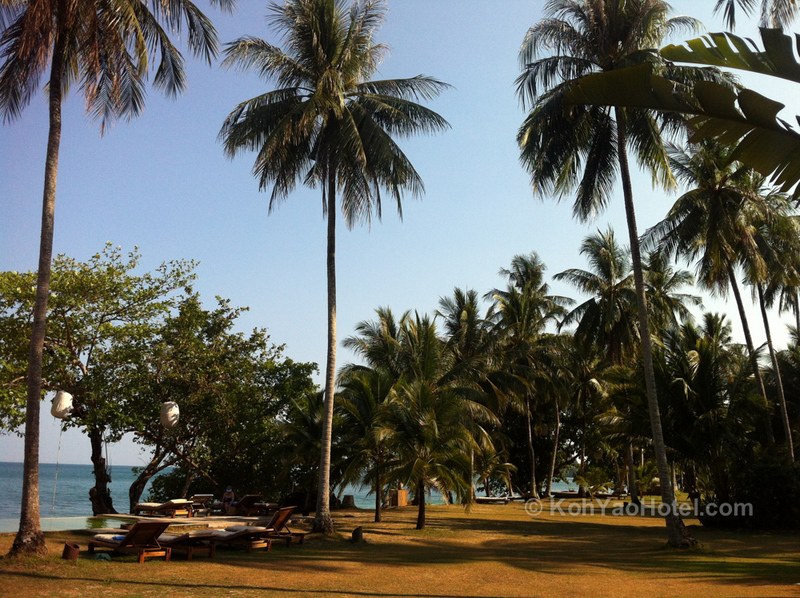 At the very southern end of Klong Jark beach perches the Sabai Corner resort, which is a great spot for a sweeping view of the whole of Klong Jark. They also sell some great homemade icecream here and have salas (small wooden platforms with roofs for shade) built along the shoreline directly overlooking the rocky outcrops that slide into the sea. 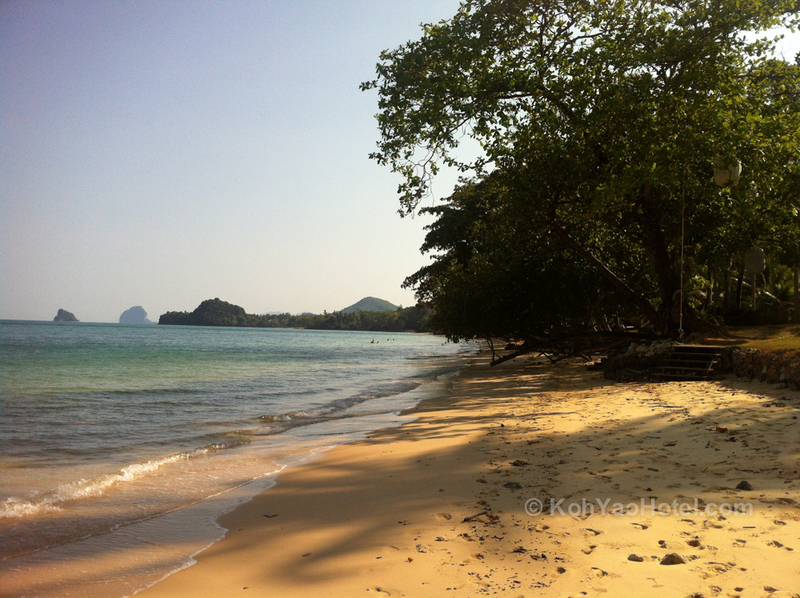 Continue past Sabai Corner and you soon arrive at the northern end of Pasai Beach. In the opposite direction from Sabai Corner, once you’ve gone past Niramaya and Villaguna, the road keeps following the beach and then Klong Jark seems to come to an end – however, it’s just a twist in the road and then you re-emerge onto another straight flat expanse of sand with a straight road. The atmosphere here is different though. There’s only one sprawling resort, Holiday Resort, and nothing else here, so it feels like a separate beach. 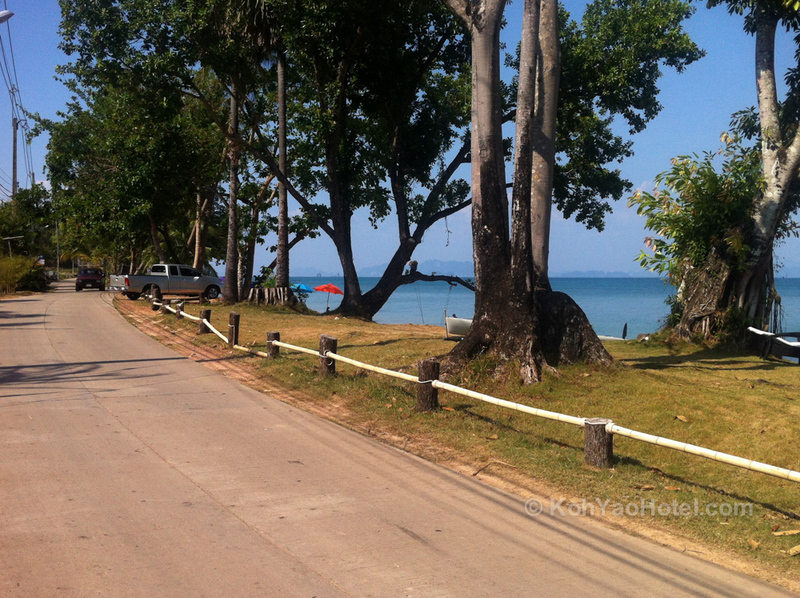 As you head further north, Klong Jark beach disappears and the road heads through some tropical forest. 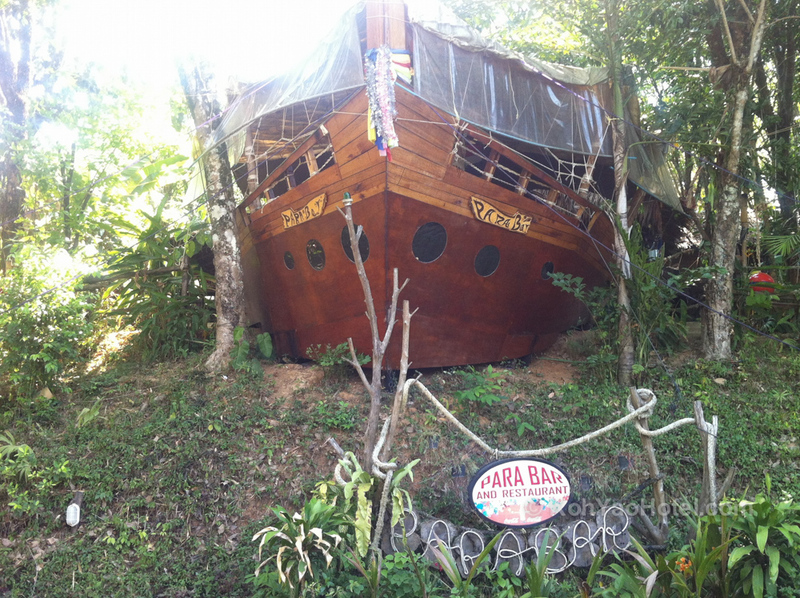 Nestled within the forest is the visually arresting Para Bar, which is essentially the bow of a ship emerging from the hillside. Next to it is an interesting art gallery and cafe. The north of Klong Jark Beach is home to two exclusive luxury resorts – Six Senses Koh Yao and the somewhat more affordable but still opulent Koyao Island Resort And Spa. 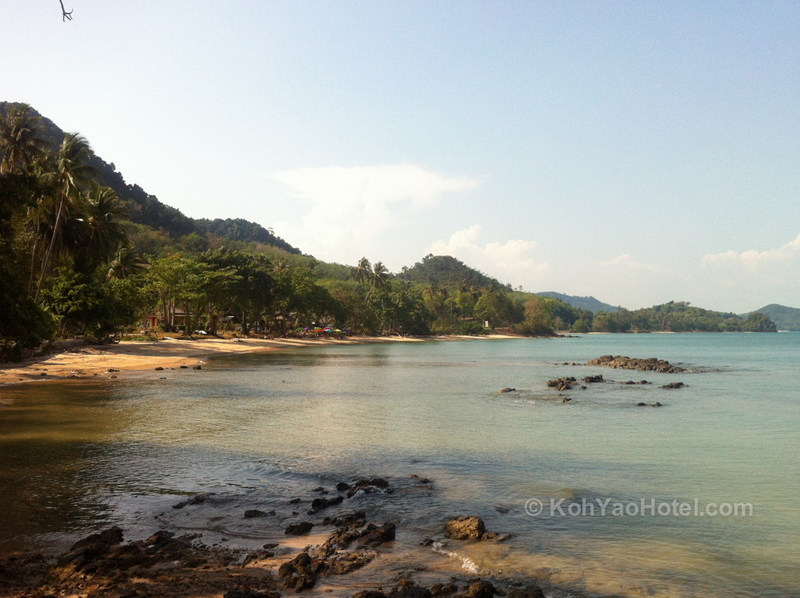 Both resorts effectively have their own private beach as north Klong Jark is quite remote from the central and southern stretches of the same beach. You cannot really access north Klong Jark beach unless you are staying at one of these resorts (or pay a visit for a drink, although Six Senses will not allow non guests onto the premises). Koyao Island Resort has a beautiful stretch of white sand in front of its meticulously manicured tropical lawn and palm trees around an infinity pool. 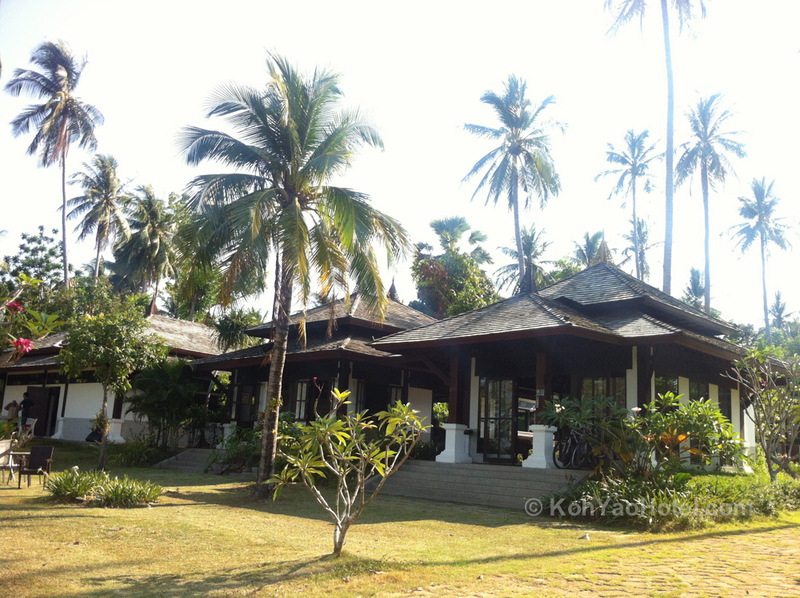 The resort’s architecture itself is equally impressive with a pleasantly cool open air bar and restaurant nearby to the pool and secluded lodgings nestled amongst the palm trees in classic Thai style dark wood and white plaster. 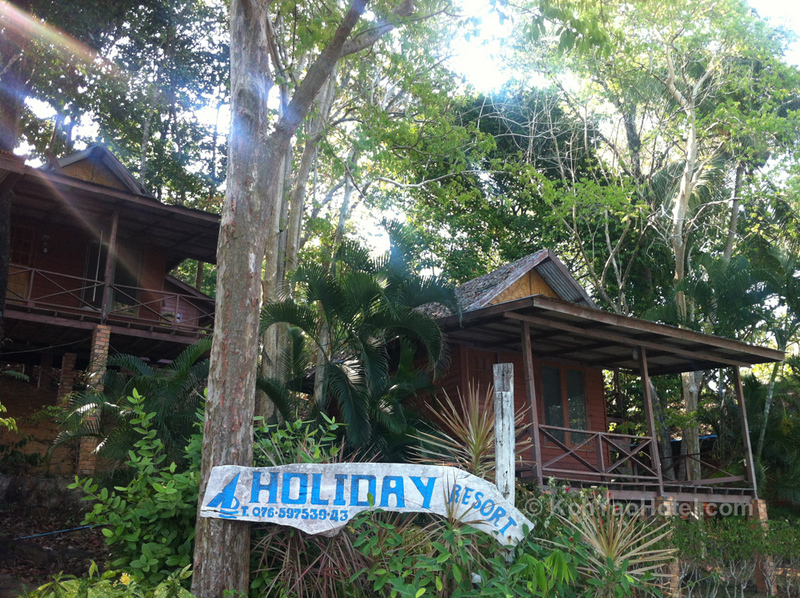 The sense of seclusion is accentuated by the 1 kilometre dirt track that separates Koyao Island Resort from Koh Yao’s already modest main road. 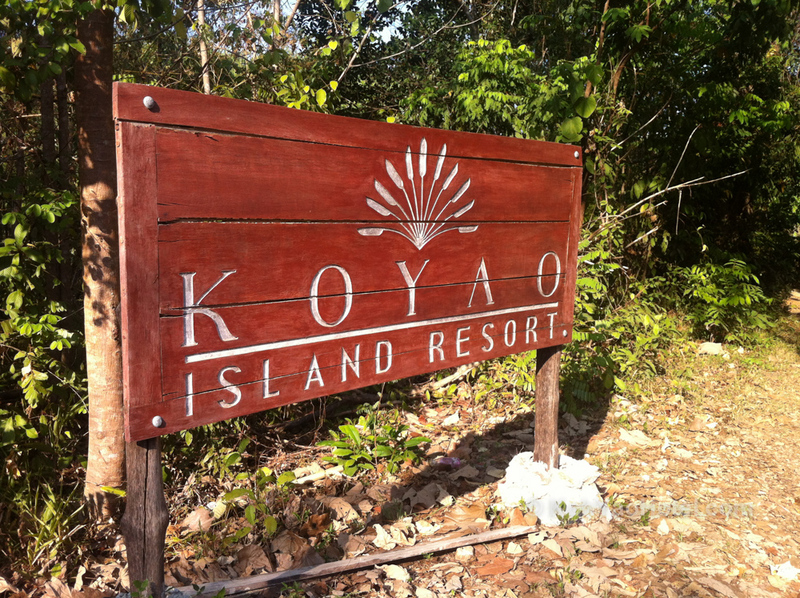 The original owner and architect of Koyao Island Resort went on to launch the other luxury development on Koh Yao Noi – Koyao Bay Pavilions which is located in the south east of the island on Lom Lae Beach. Chan Restaurant, which serves Thai food, is the only restaurant within walking distance of the two luxury resorts, although La Luna, which is an Italian restaurant a couple of kilometres away beyond Tha Khao Village, delivers pizza direct to your resort. There is also an ATM machine set up on its own on the roadside directly opposite the Six Senses Koh Yao resort entrance. You’ll also see a rustic helicopter pad built by the side of the road near the ATM for Six Senses guests who are in a hurry. 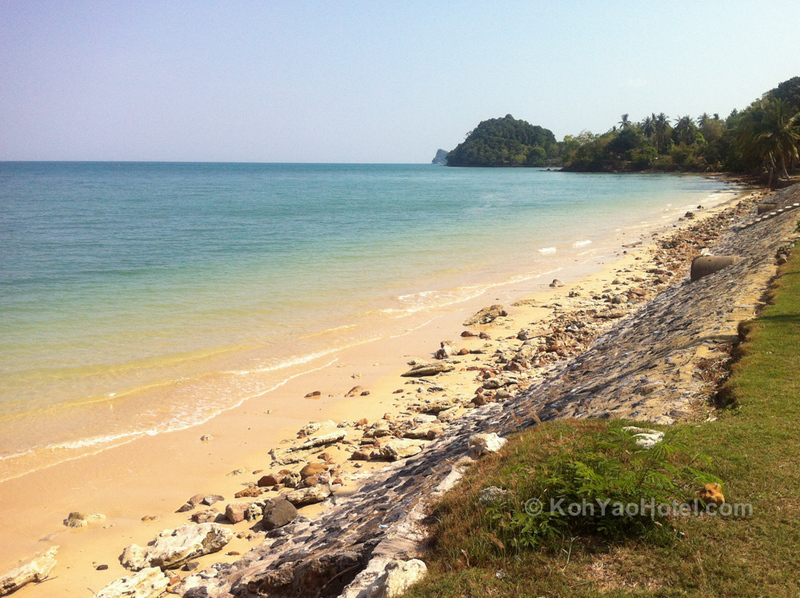 Once past the ATM, the road continues to climb as it leads on to Tha Khao Bay Beach. 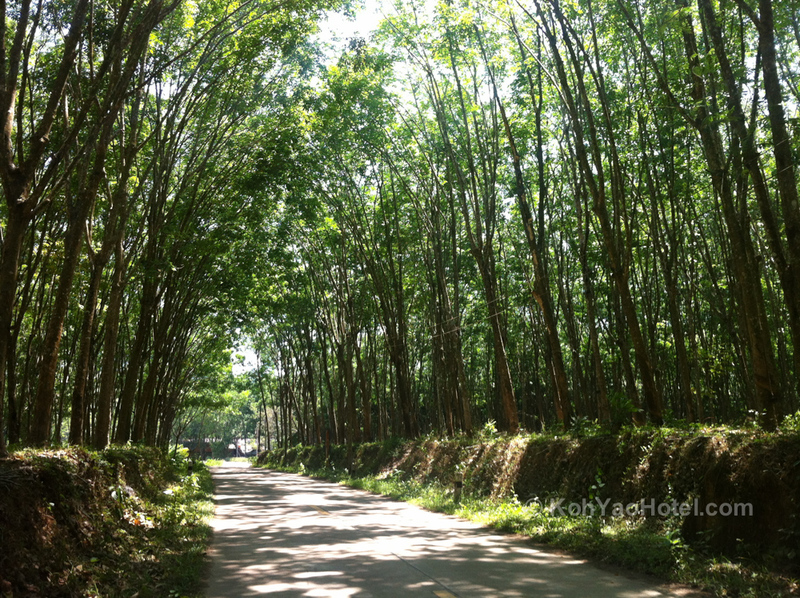 You’ll pass through a beautiful bower of rubber trees over the road.